Through the spires I can picture what I came for, but I cannot see it. The night is too dark. The canyon too black. Out here, alone, teetering on a thousand foot precipice, I’m waiting for something that won’t appear tonight— the galaxy. 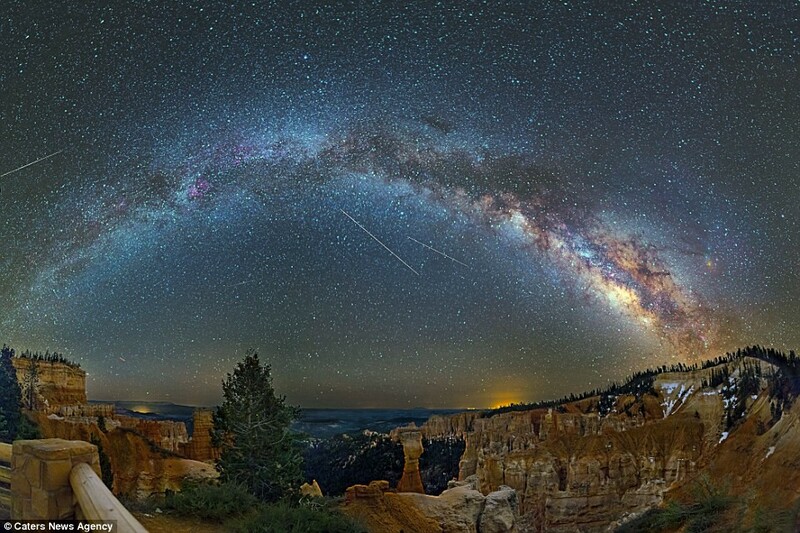 Bryce Canyon is renowned for its stargazing. Hundreds of miles from the night time light pollution that hides the Milky Way from most of human kind, this place is a haven for the evening. It is also completely unnerving. Towering pinnacles of rock punch hundreds of feet into the sky from the ground below. Lingering vestiges of an ancient sea, these spires have made Bryce Canyon famous. Dubbed hoodoos by scientists, the pillars stand sentinel over my hour-long vigil: less than the blink of an eyelash in their geologic day. A narrow, dirt path serves as my perch between their spires and a lethal fall to the canyon floor below. The path crumbles under my every step. I cannot, if I try, see the canyon floor below or its crest above — nor any curious mountain lions drawn in by the flicker of a phone and the clack of a camera shutter. I came here to look at the universe, to see the Galaxy. Instead, I can see nothing. I cannot see my hand in front of my face. The wind howls through the hoodoo fields. It whips over my perch and down Navajo Trail. This path has a name. “More rocks fall on this trail than any other trail in the park,” exclaims the National Park Service website. Ghosts of the past seem to beckon through the darkness as I contemplate trekking further into its depths. Tolkien’s famous phrase sends a chill down my spine. There will be no more trekking down tonight. Somewhere, at the top of this great canyon’s wall lies my waypoint: the place where this journey began and the Dunharrow of my mind. Reaching its relative safety was my only goal. Damn this canyon. Damn these ghosts. Damn this darkness. How did I get here? By reaching a step too far. Or was it just far enough? Camera, check. Tripod, check. Mountaineering jacket, check. Water and rope? Check. Travel companions? No. Bravery would be my only company tonight. Down to the depths I went. But that photo was taken at the trailhead, at Dunharrow. I wanted to go a step further — I wanted to see the galaxy from below the hoodoos. What I actually saw was something far more powerful: something more elusive than a starlit sky. I found it about halfway back up the trail. No, not the galaxy— but the realization that I was completely alone. I had expected other hikers and photographers to join me on the path. But as dusk settled on the valley 60 minutes prior, only I had remained. No one, no thing — not even cell phone reception — decided to join me. Solitude. That is what I was looking for. Terror is real. It’s not something we are used to confronting now, in an age where you’re never truly alone. When someone, somewhere is never more than a text away. But there is only darkness in the canyon, only the howling wind whipping through the hoodoos, under your nose and into your ears. If there is company to be found, it is in a strange, pervasive fear. 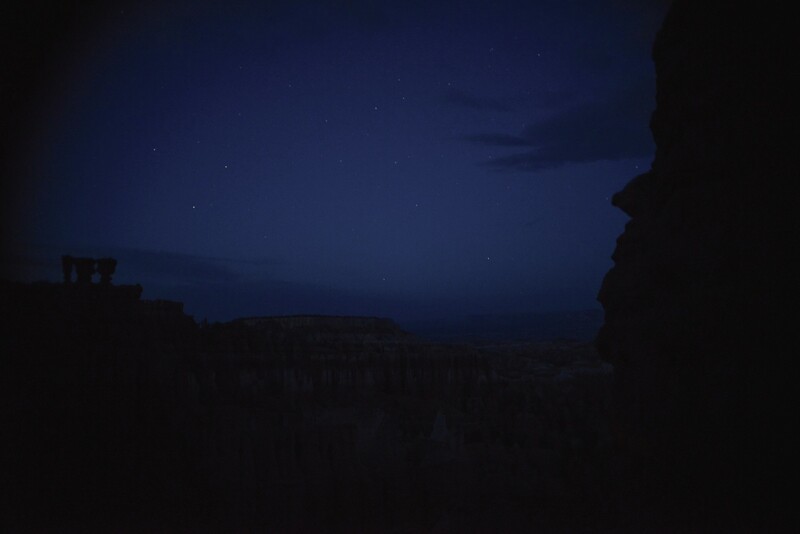 On cloudy nights in Bryce Canyon, it’s just you and the darkness. Fear makes you feel alive. It makes you want to get the hell out of a pitch black, deserted canyon filled with rattlesnakes, scorpions, mountain lions and the imagined ghosts of dead civilizations. It also makes you curious. As I hiked swiftly out of the blackness, I wondered— what was I really afraid of? I knew it wasn’t the dark. My terror stemmed from being alone. Each step and each breathe pushed me back up the trail, closer and closer to cell service, closer to a human connection. The human connection is what I was missing down there. The human connection is the addiction behind social media. It’s the tiny peak of adrenaline with every Instagram notification. It’s the smirk when you get a Snapchat. In 2015, you know that no matter where you are, you’re never truly alone. The thing is — until as recently as ten years ago, that constant connection was not a part of the human experience. There were, and perhaps should be, long periods of solitude amidst our interactions. It’s arguable that some of the greatest literary works (never mind scientific achievements) of our species would never have been completed in a world of constant communication. Walden Pond would have been a GPS location. The Old Man and the Sea would have been a photo album on Facebook. This Blog would have been a post on Medium. Okay, so the last one is true. And it is perhaps the reason that there is no more grandiose tale about my search for the galaxy that night. Perhaps, without the promise of a quick and easy out, I would have ventured further down the path. As I crested the top of the trail, a young couple greeted me. They were gazing at the sky from Dunharrow, from the very observation point in the photo I failed to emulate. But I had still seen something in the canyon that they would not. It wasn’t the galaxy; it was myself. Communication is a double-edged sword. And sometimes, to find yourself, you have to put the blade down. Putting the phone down takes more courage than walking along a dark and winding mountain path. Breaking the constant connection is not easy, but sometimes, it’s the easiest way to find yourself.